Looking for deals in Cardiff? Located in Cardiff city center, Cathedral 73 is a Victorian townhouse with a funky, fresh and fashionable design. The whole atmosphere is great. It is a quiet boutique hotel, ideally placed, with great staff. This country house hotel is in quiet gardens, just off the M4 motorway and 5 miles from Cardiff city center. It has views of the mountains, free parking and free Wi-Fi is available throughout. 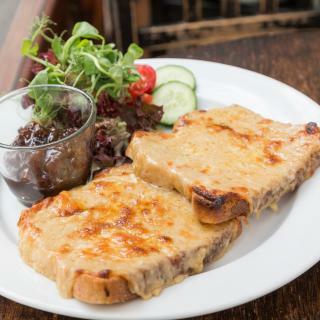 Staff were so helpful and friendly, breakfast was incredible for the price- great selection and attentive staff on hand. Rooms clean and great size. Would absolutely recommend. Number One Hundred Bed And Breakfast is a small boutique B&B a 15-minute walk from the center of Cardiff. It has free Wi-Fi, a lovely unique decor and some free parking. The beds! They were so comfy especially after a long day of walking and sightseeing. Abi gives all kinds of suggestions on things to see, but isn't pushy in the least. She just wants you to enjoy your time! Carefully restored and developed to provide you with all the comforts of modern living, this Victorian town house is ideally situated within easy walking distance of central Cardiff. Friendly hard working staff and the proprietor is actively involved. Wonderful breakfast with an extensive menu. Perfect location near civic center. A roaring log fire and fantastic views of Cardiff and the beautiful Vale of Glamorgan make this hotel and its restaurant an ideal venue. The was a beautiful location. You have a wonderful view of Cardiff and the bay from the hotel! In the heart of Cardiff city center, this family-run hotel offers free high-speed Wi-Fi and a full cooked breakfast each morning. 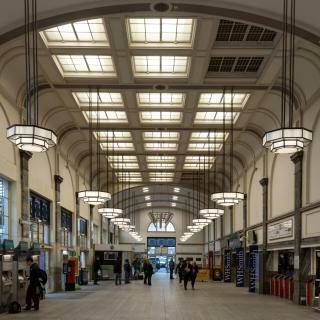 Cardiff Central Rail Station is a 5-minute walk away. Everything was good. I had stayed on a previous visit so aware that there is no elevator. Located between the Principality Stadium and Cardiff Castle, Holiday Inn Cardiff City offers rooms and facilities for business and leisure guests. The food available from the bar and restaurant was excellent and plentiful. In a prime city center location, this 4-star luxury hotel has a swimming pool, a gym and a spa. The main shopping district is a 5-minute walk away. There is free Wi-Fi throughout. Friendly staff, central location, clean and tidy. 0.5 miles from the Cardiff International Arena, this Novotel has an indoor swimming pool, a gym and restaurant. 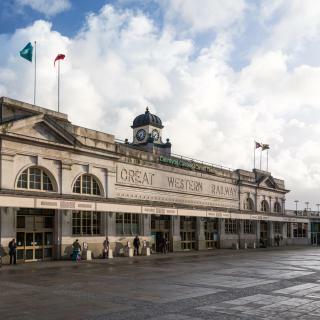 Shops, nightlife and Cardiff Central Rail Station are all 10 minutes’ walk away. Great location for Millenium Centre (20 mins brisk walk), or city centre shops (15 mins walk). In the waterfront area of Cardiff Bay’s old East Dock, only 20 minutes’ walk from the heart of the city center, this modern hotel offers a restaurant, bar and terrace and is located just 1640 feet... The friendliness and comfort. The brilliant location. Ideal for both Cardiff and Newport, ibis Cardiff Gate - International Business Park is in Cardiff's business district just off junction 30 of the M4 motorway. The breakfast area was very clean and tidy as was the breakfast itself. Number One Hundred Bed And Breakfast is a small boutique B&B a 15-minute walk from the center of Cardiff. It has free Wi-Fi, a lovely unique decor and some free parking. The beds! They were so comfy especially after a long day of walking and sightseeing. This luxury hotel is in the city center, looking out over Cardiff Castle and City Hall. It has large air-conditioned rooms, a 20-yard heated pool, a gym, spa, sauna, steam room and spa bath. Excellent location , pleasant staff, easy check in and out, spacious room with good view ..
With a great location in Cardiff’s center, Jurys Inn Cardiff is set in a beautiful Victorian building and features a a restaurant and bar. Rooms each feature stylish décor and a flat-screen TV. Excellent location, well appointed rooms, plenty of restaurants and cafes nearby, and great staff. Set in an iconic building, with stunning views across Cardiff Bay, the 5-star voco - St David's Cardiff features a luxury spa, stylish bedrooms and an innovative restaurant and a bar. Phenomenal brkfast, dinnerok staff above and beyond, cheerful and helpful. Well located in Cardiff city center, this Premier Inn features modern rooms, with some offering views out over the city. The shops of Queens Street are just 330 ft away. The Holiday Inn Cardiff North M4 Jct 32 is nestled beneath the scenic Castell Coch (Red Castle) in the village of Tongwynlais, off Junction 32 of the M4 and 20 minutes’ drive from Cardiff city center.... Most comfortable bed I've found in a hotel/motel. Same for the pillows. Offering a terrace and views of the sea, The Beach House Hotel is set in Penarth in the Glamorgan Region, 2.2 mi from Dinas Powys Castle. Guests can enjoy the on-site bar. I’ve traveled extensively and this was by far the best hotel experience I have ever had.. Which hotels are the best ones to stay at in Cardiff? Hotel Indigo - Cardiff, Cathedral 73, and Lincoln House Private Hotel are some of the popular hotels in Cardiff. How much is a hotel in Cardiff for tonight? On average, it costs $83 per night to book a 3-star hotel in Cardiff for tonight. You'll pay around $166 if you choose to stay in a 4-star hotel tonight, while a 5-star hotel in Cardiff will cost around $184, on average (based on Booking.com prices). Which hotels in Cardiff are good for families? Many families visiting Cardiff loved staying at Hotel Indigo - Cardiff, Lincoln House Private Hotel, and Cathedral 73. Which hotels in Cardiff offer an especially good breakfast? For hotels in Cardiff that serve highly-rated breakfasts, try Lincoln House Private Hotel, New House Country Hotel, and Hotel Indigo - Cardiff. What are the best hotels in Cardiff near Millennium Stadium? Some of the best hotels in Cardiff near Millennium Stadium include Hotel Indigo - Cardiff, Inn Cardiff and Stunning Loft Apartments. Which hotels in Cardiff have nice views? voco St. David's Cardiff (formerly The St David's Hotel & Spa), New House Country Hotel, and Holiday Inn Cardiff City got great room view-related reviews from travelers in Cardiff. Which hotels in Cardiff are good for couples? These hotels in Cardiff are highly rated by couples: Hotel Indigo - Cardiff, Manor Parc Hotel, and Number One Hundred Bed And Breakfast. How much does it cost to stay in a hotel in Cardiff? On average, 3-star hotels in Cardiff cost $95 per night, and 4-star hotels in Cardiff are $122 per night. If you're looking for something really special, a 5-star hotel in Cardiff can be found for $150 per night, on average (based on Booking.com prices). What are the best hotels in Cardiff near Cardiff Airport? Travelers who stayed in Cardiff near Cardiff Airport (CWL) have said good things about Holiday Inn Express Cardiff Airport, Celtic International Hotel Cardiff Airport, and Vale Park Hotel. Which neighborhood is the best one to stay at in Cardiff? Cardiff Bay, Cardiff Center, and Cardiff Outskirts are popular with other travelers visiting Cardiff. Capital of Wales, Cardiff is a wonderfully green city steeped in national pride. At its heart is enormous Bute Park, divided by the River Taff and named after the marquis that once lived in Cardiff Castle overlooking it. In fact, this is just one of 5 castles within the surrounding area. 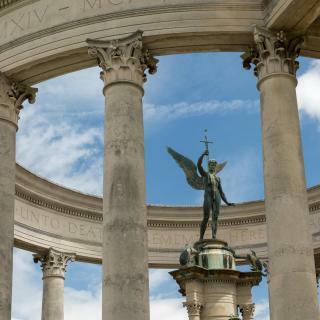 Over the road is Cathays Park, a beautiful square flanked by Edwardian architectural masterpieces including Cardiff City Hall and the excellent National Museum of Wales. Another must-see is St Fagan’s National History Museum, one of Britain’s top attractions. From Victorian arcades to the fabulous St David’s Center, shopping in Cardiff is fantastic. And there’s no shortage of pubs and restaurants for a short rest or meal. Those by Cardiff Bay have particularly pleasant views. 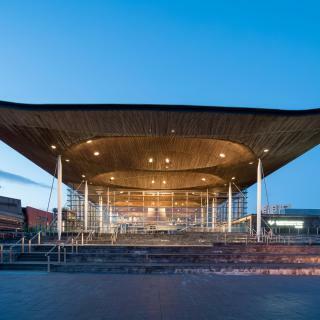 Also by the bay are the futuristic National Assembly for Wales and the Wales Millennium Center. Another year 2,000 landmark is the Millennium Stadium, a state-of-the-art venue for international rugby and soccer matches, as well as concerts. Next door is Cardiff Arms Park, home to the city’s rugby union team, while Cardiff City FC’s new stadium is in the west. 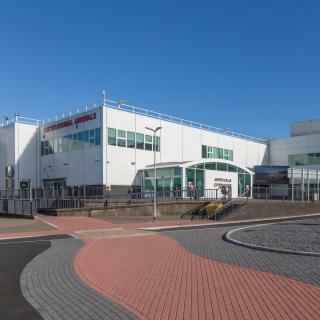 Cardiff Airport is further west near Barry and Booking.com have an excellent range of hotels, B&Bs and apartments both near there and in the city center. Cardiff is a fantastic city. Cardiff is a fantastic city. There are lots of shops to stroll around, meandering around the arcades, and lots of restaurants to choose from to re-energise yourself in between your retail excursion. The city has a fantastic history and a great market. The city has a die-hard sports following. The stadium if great for those awesome rugby or football matches and close to a vast array of restaurants for before/after game celebrations! Don't forget to check out Cardiff Bay. A beautiful redeveloped area, walking distance from central Cardiff or you can catch the train from Cardiff Central. Been to Cardiff many times and always enjoy the City. Been to Cardiff many times and always enjoy the City. Shopping is very good and has improved a lot over the years along with eateries. I was quite saddened to see the amount of homeless people on the streets which isn’t just a Cardiff issue but is still upsetting to see. I used to live here and was shocked to see how much had changed. Despite being a city it still feels very homely and friendly. Awful lot of homeless and saw a few people being aggressive towards them, would be great to see more support for the homeless around the city via council and community. It’s heartbreaking seeing the huge increase in this issue over the past few years. Great city with a lot of history and culture, good for shopping and eating out. The castle and cardiff bay are a must see. Even though the city is small you never run out of things to do and only few minutes drive the countryside, all the locals friendly and eating and drinking out is very cheap, well much cheaper than other UK cities. Cardiff is a beautiful place. Cardiff is a beautiful place. Friendly warm. However it does have a large group of homeless that keep hounding people for money. The Welsh cakes are nice and all in all a good place that has everything for all budgets. We stayed at the Radisson Blu right across the street from a major mall with 30 restaurants! The castle and everything there was fabulous. We can’t wait until the opportunity comes to go there again. Loved this apartment. Would definitely stay here again rather then a hotel. Friendly welcome, complimentary milk, cereal, tea & coffee. Wifi included, spacious rooms. We stayed in 2 bedroom standard apartment. There was one ensuite bathroom with a shower and another bathroom with a bath & shower. Everything was clean, comfy. Home from home. Local to everything, only 10min to to Cardiff bay, 15min walk to city centre & fantastic shopping area. The property is in an excellent location in the city centre with easy access to the city and Cardiff Bay. The apartment is very clean and very well presented with excellent facilities . Would definitely stay here again - highly recommended . Cardiff Castle views from our room. Friendly and helpful staff. Location couldn’t have been better, directly across from the park/gardens, Cardiff Castle and the heart of town. The bay was only a 20 minute walk away. Great location nearby the Cardiff bay, just 300 ft from Cardiff Bay bus stop, easy to get to city centre by buses. Especially the front office staff was so absolutely friendly, and helpful, highly recommended. The hotel is good for conference/course stays only a short drive from Cardiff Bay or City Centre. The rooms are reasonably priced, clean and comfortable. Free parking on site is very useful. Very close to Queen’s street train station making it very easy to get to Cardiff bay. Very close to the city centre. Staff were very helpful and accommodating. Comfortable bed and good shower. It was clean. It is outside Cardiff but you can catch a bus 5 minutes from the hotel that takes you to the centre in around 30minutes. Good location (15 min walk to city centre). Spa ( no extra charge). Reception very friendly. Hotel seems quite new/refurbished. Location was terrific with wonderful uninterrupted views of the whole of Cardiff down to the Bay from our bedroom/balcony. City centre of Cardiff a 5 minute walk away, comfortable beds, clean rooms, easy check in & check out. Excellent location within walking distance to Cardiff Bay, Cardiff Castle and the city centre. Fantastic view over Cardiff bay. The health spa is very good. Room service excellent. I like everything about this property especially the location, value of money, room service and very friendly staff. The breakfast was outstanding! The hotel is right by the train station and town center. Staff is really nice. Friendly, warm staff and an elegant building. The room was so spacious. We really loved this place! The room is very spacious and clean. Good location and value for money. Would visit again!